A vortex in the atmosphere can churn with enough power to create a typhoon. But more subtle vortices form constantly in nature. Many of them are too small to be seen with the naked eye. When simple, or "Newtonian," fluids (like water) flow very fast or along a curving path, swirling vortices develop. Their formation costs energy and increases "drag force," so that more energy is required to move a fluid in the desired direction. In large infrastructure like oil pipelines, the extra energy input required to pump the fluid comes at a significant financial cost. By adding small quantities of polymers to the oil, scientists can reduce the intensity of the vortices; the oil will then flow at the same speed but with a reduced pumping pressure, saving energy and money. While this phenomenon has been known about since the 1940s, many questions remain about exactly how the polymers work. Although ubiquitous in the environment, vortices have proven difficult to capture and study in the laboratory. Recently, however, researchers at the Okinawa Institute of Science and Technology Graduate University (OIST) created a way to examine these small-scale whirlpools with the aid of a device specially developed for this purpose. Published in the journal Physical Review X, their recent paper examines the formation of vortices in fluids with and without added polymers. "We can see very dramatic effects even with very small concentrations of added polymer," said Noa Burshtein, first author on the paper and a Ph.D. student at OIST. 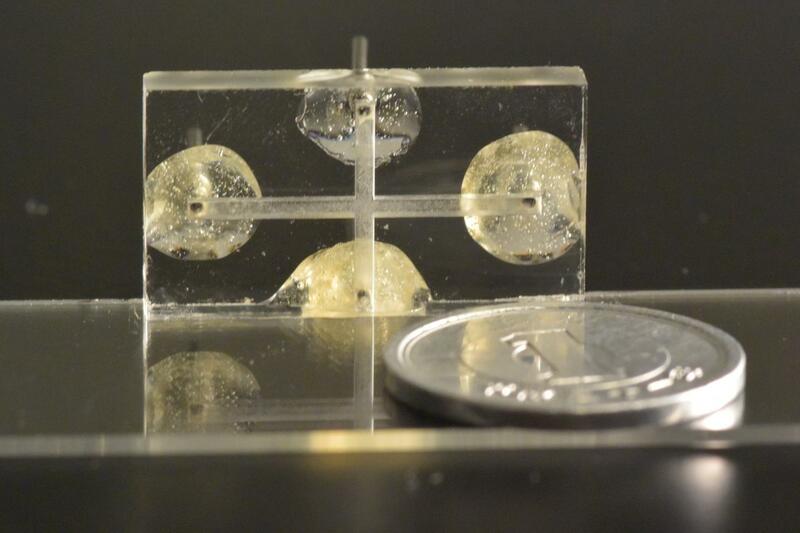 Using a 3D printed "microfluidic" device–a small block of glass containing a pair of microscopic crossing channels not much wider than a human hair–the scientists were able to create a vortex that could be readily examined under a microscope. The researchers first studied the formation of vortices in water, using tracer particles, which enable scientists to track the motion of a fluid. Next, they introduced tiny amounts of polymers into the water. They found that the addition of just one part per million of polymer helped the fluid to flow more smoothly. The OIST researchers collaborated with colleagues from the University of Liverpool, who carried out computer simulations of the experiments to help understand how the polymers–elastic molecules that behave a bit like microscopic springs–affect the flow. "With the aid of the simulations, we were able to clearly show where the polymers stretch in very specific regions of the flow, and how this acts to suppress the formation and growth of the vortex," said Dr. Simon Haward, corresponding author on the paper and group leader in the Micro/Bio/Nanofluidics Unit at OIST. Their work has numerous applications on both small and large scales. For instance, small amounts of polymers are used to enhance blood circulation in patients with weakened hearts. These molecules can also be used to suppress jet fragmentation–when many little droplets of fluid form–which helps improve the resolution of inkjet printers. Polymers also help suppress vortices in large scale infrastructure, like oil pipelines and sewers. "Our discovery also has implications for optimizing flows in lab-on-a-chip devices being developed for microfluidic diagnostic and biomedical applications," said Amy Shen, professor of the Micro/Bio/Nanofluidics Unit at OIST and coauthor of the paper. The scientists said they hope to build upon the study in future research. "It is quite exciting to reveal the effect of the polymer so clearly for the first time," said Haward.